The Governments of Montserrat and Antigua and Barbuda today signed a memorandum of understanding (MOU) to include passenger eco-excursions to Montserrat, as part of the list of activities offered to cruise line clients who visit Antigua. 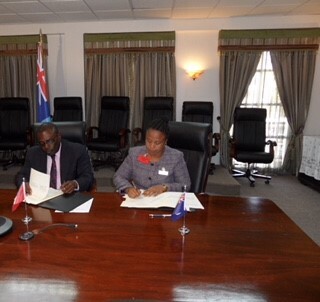 The MOU was signed in Antigua and Barbuda by the Permanent Secretary in the Office of the Premier (Montserrat), Daphne Cassell and the Permanent Secretary in the Ministry of Tourism and Investment (Antigua and Barbuda) Walter Christopher, on behalf of their respective Governments. The MOU will take effect from Wednesday, August 1st 2018 for a period of two years. Under the agreement, cruise lines that regularly visit Antigua will promote the 6 to 7 hours ‘Eco-excursion tour to the Caribbean Modern Day Pompeii’ on Montserrat along with a list of other excursions in Antigua. The excursions to Montserrat will be facilitated by the Montserrat Ferry Service which will be made available for this purpose, as required. The signing of the MOU follows recent discussions between Premier, the honourable Donaldson Romeo and Antigua and Barbuda’s Minister for Tourism, the Honorable Charles Henry Fernandez. On Thursday, July 26, Premier Romeo met with Mr. Fernandez to discuss actions and plans in train for partnerships in tourism between Antigua and Barbuda and Montserrat.